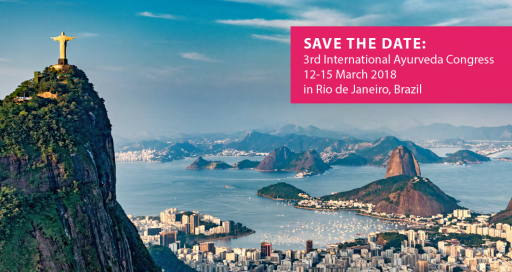 The Brazilian Government has stepped forward to host the 3rd International Ayurveda Congress in Rio de Janeiro in 2018 as part of the First International Congress on Integrative Practices and Public Health. This is an important step in the integration of Traditional and Complimentary Medicines, such as Ayurveda, into the national health system and we applaud the Brazilian government for its progressive thinking. The government of Brazil will provide a venue for 3.000 – 5.000 delegates, and both the Health Minister and the Minister of AYUSH of India are planning to attend. Watch for details in upcoming IMAVF NewsMagazines and IMAVF Bulletins.